JH: Writers hear it all the time—“Oh, you should start a blog.” Not a bad idea, but the hard part is knowing what to blog about. Bryn Donovan visits the lecture hall today to share some ideas on just what to do with our authors’ blog. Bryn Donovan earned her MFA in creative writing from the University of Arizona, and in her day job, she’s the acquiring editor for Hallmark Publishing. She’s published novels both as Bryn Donovan and as Stacey Donovan, and she’s also the author of 5,000 Writing Prompts and Master Lists for Writers. She blogs about writing and positivity at bryndonovan.com. When I first began my blog a few years ago, two friends of mine, my husband, and my sister-in-law were my only readers. Writing posts would sometimes feel pointless, but I told myself Well, you’ve got to start somewhere. Now I have over 3,000 subscribers, and I get 4,000 to 5,000 people a day reading my posts because they found them in an online search or on Pinterest. It’s the main way people find out about me and my writing. One thing that keeps some people from blogging is that they’re not sure they’ll be able to think of enough things to write about. 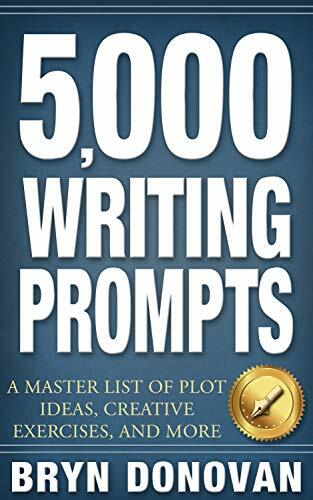 In my book 5,000 Writing Prompts, I included 500 ideas for blog posts. 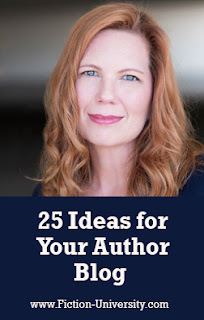 Here are twenty-five ideas, most of which aren’t in the book, geared specifically for author blogs. I hope you like them! 1. Share ten weird facts about yourself. This is a classic for a reason. It’s a great first post…and it’s fun to do after people think they’ve gotten to know you, too. 2. If you’re trying to decide between a few different photos for the official author photo on your blog, ask people to weigh in. This is a great first or second post for a blog that gets people engaged and connected with you. 3. Can’t decide what story to write next? Share the ideas you’re considering and ask people to vote. 4. If you’re writing a horror story, write about haunted places or scary incidents. If you’re writing a mystery, write about a real-life unsolved mystery. If you’re writing a romance, share your favorite romantic scenes in movies. 5. Write about ten of your favorite books of all time. 6. Near the end of December, write about the best books you read in the past year. 7. Share your “dream casting” for your work in progress: choose an actor for each character in the story. 8. Share photos of your writing assistants—that is, your pets—and ask others to do the same. People love showing you pictures of their cats and dogs! 9. Post a roundup of your favorite public domain quotes about reading and writing. 10. Share your writing research! If you’re setting a novel in Chicago, post a list of movies set in Chicago. If you’ve learned something interesting about medieval weaponry or scientific breakthroughs, tell everyone about it. 11. Post a list of all the weird things you’ve Googled as a writer. It’s funny, and it may make people curious about what you’re up to. 12. Share a mood board of your work in progress: put together a grid of nine images that express the feeling of the story. 13. Invent and share a recipe for something easy, like a sandwich or a cocktail, inspired by your work in progress. Maybe you could create a few for various characters! 14. You can also create recipes, cocktails, or “mocktails” based on fictional characters you love from a TV show, book series, or movie...especially if you’re writing something in a similar vein. 16. If you’re a struggling writer, share your best dirt-cheap recipe or your best tips for being frugal. 17. Share the results of a personality test you took, and ask people what their type is! 18. Or share the zodiac signs, Myers-Briggs types, or enneagram types of the characters in your work in progress. 19. Write about a trip you’re planning or a goal you’re pursuing, and ask for advice. 21. Ask people what their three proudest accomplishments are…and share yours, too. 22. Post pictures of book covers you love. 23. If you ever happen to be in the very fortunate position of having two different choices for the cover of your next book, and you love both of them…ask people to vote. They’ll love it. 24. Share photos of the place where you do most of your writing. Maybe add photos of other writer’s spaces and studios. Ask their permission first, but if you’re linking to their blogs, they’ll probably love it. 25. Write about the top ten authors you admire in your genre. You don’t have to ask to link to their blogs or websites. They will definitely love it. Whether you’ve just been thinking about starting a blog, or if you already have one, I hope you found something here to inspire you. If you’re a blogger, please share your advice for others in the comments—I’d like to learn from you, too! Thanks for reading, and happy writing! Never have writer’s block again. 5,000 Writing Prompts is the must-have resource for novelists, short story writers, screenwriters, creative writing teachers, bloggers, memoir writers, playwrights, improv actors, and other creators and storytellers. 150 plot ideas for each of these genres: fantasy, science fiction, mystery, romance, young adult, historical fiction, and general fiction hundreds of other master plots from classic fiction and mythology hundreds of dialogue, character, and setting prompts 100 poetry exercises hundreds of prompts for personal writing and journaling 500 blog post ideas…and much more! From the author of Master Lists for Writers, this comprehensive book is filled with inspiration. Let it spark your imagination and remind you that your creative possibilities are truly endless. I have a blog as a writer, but have struggled to come up with an idea these past few weeks. What a unique and promising book, Bryn! Thanks. Hi, Pam! I think all bloggers hit a dry spell sometimes...and I was inspired to do the list of 500 blog ideas in the book because I know that, personally, I can get in a rut. Thanks for reading, and thanks for the kind words! Thanks, Bryn. I've been struggling with this for a couple years. I had nothing meaningful to offer the world. I had no clue what to put in a blog, and my first attempt failed miserably. I decided if I had to blog to be a successful writer, I would just have to settle for second best and curl up in a corner hugging my muse. Now you've given me enough hope to be willing to try again. Linda! Don't EVER say you have nothing to offer the world! It can be hard to get a blog off the ground, and I probably should've mentioned in this article that I had TWO failed blogs prior to getting one that succeeded (and that one took a while to catch on!) A person certainly doesn't have to blog to be a successful writer, but if you're interested, I would definitely try again. Thanks for reading, and thanks for commenting! Good luck with all your writing! I rack my brain every time it gets close for me to have a blog post up and running all because I get flustered about what to write about. This is going to be helpful. I'm hoping it will spark other ideas too. Thank you. Hi, Glynis! Oh, I am *so* glad it's going to be helpful. And yeah...any time I do a blog like this, it helps people think of completely different ideas, too. :) Thanks for reading, and thanks for commenting—I really appreciate it! Great article. I copy edit for indie authors, and blogging is another way to promote their books, but I've never considered sharing the weird personal information as stated above. All of these ideas can be adjusted to an editor's life. Thank you for sharing! Hi Mitzi! Ooh, I should've thought of that...a lot of these would be *great* for an editor's blog, too! I think if people are looking to hire someone, they like to get to know them...and it's a good way to stay on people's radar, too. :) Thanks for posting! I still consider myself new to blogging. Although I've been doing so for a year, I don't post often. Partly because I don't enjoy it as much as my poetry writing and partly because I struggle with what to write. I've asked followers to suggest things, but no one has been as prolific with Bryn in her list of ideas. Thanks, Bryn. I'm saving this! Great ideas Bryn. I have a blog but don't post as regularly as I should. This should help me be more consistent! Hi Christa! I often find it a challenge to keep up with regular posting. :) I'm expecting to use some of my own ideas in the big list in the book! Thanks for reading. Hope all your writing is going well!